for at least20% in 3 months. the phone conversation in 90%. 25% – THAT’S THE SHARE OF CLIENTS THE AUTO REPAIR LOSES BEFORE STARTING THE CONVERSATION. 623 missed calls out of 1492 in one month. 42% loss during the early call stage. Do you track missed calls? Do you have automatic call record? Do you have the standards of customer service during the phone conversations? 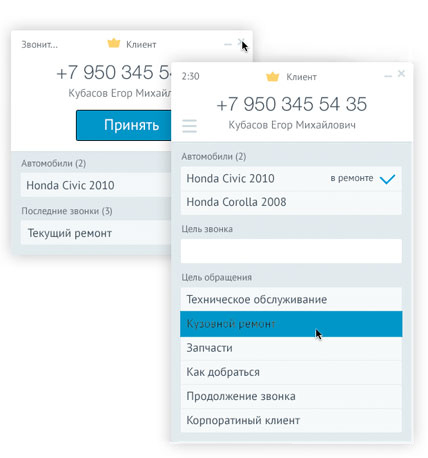 If you do not have it, than the implementation of our system will solve the issue of incoming calls processing. will be always in front of you. and holds a personal consultation. You fill in the questionnaire, which helps us make your work more comfortable. We install and configure our system and the necessary equipment when it is convenient for you. We will explain you and your staff how to use our system. We will advise on how to make you work easier and more convenient. and solve all the issues promptly. No hidden fees or special prices. We believe that our customers have the equal rights to the best price, so our rates are open, clear and the same for everybody. WE WILL GIVE YOUR MONEY BACK. That was the main issue we’ve had: when we were explaining our associates how they need to answer the phone. When they are under supervision, they seem to do everything right. But when you call yourself and they don’t recognize you by your voice, you can hear absolutely stupid answers. It was impossible to track it. Before installing this system, I’ve never purchase anything or come to the service in 70% cases. And that was the real loss, what we were having at the call stage. Of course, we have loss even now, but now we can supervise and train our staff. If you talk to the client in the right way, he/she starts considering you, because in 90% of cases he/she was treated worse. And the money we had invested have paid themselves off a long time ago. Firstly, we have installed the software, which only records the calls, and we have increased the conversion rate only by doing it. Before it was really hard to prove to the masters that they were not talking correctly. But now, when they hear their conversations, they understand, what they have said wrong. And we have started listening to our clients’ needs. Based on the statistics, we have understood that our clients have some certain special moments, which they don’t even speak up. For example, he calls up to 3 auto repairs and asks about the pads replacement. The two auto repairs have answered that it costs 300 rubles, but haven’t mentioned anything about the warranty, work period, etc. So if these conditions were announced in one of the three auto repairs, he will trust the auto repair, which has told him it. We have set up all these parameters.